This PowerPoint was designed to utilize Pear Deck which is an interactive slide show software. 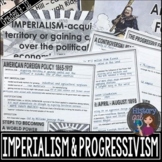 The PowerPoint reviews European immigration, Tammany Hall, Political Machines and the Progressive Era. This is geared towards US History, and APUSH. 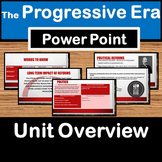 This is a PowerPoint presentation of the Progressive Era unit. There is also a free handout to be used as a guide for note taking. 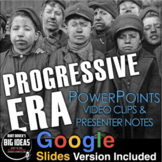 Powerpoint covering the Progressive Era of American History (1900-1920). A great framework for your class lecture! This is a 36 slide PowerPoint presentation that is visually engaging. Students love the graphics, maps, political cartoons, and images. Straight from CBails History...check it out! 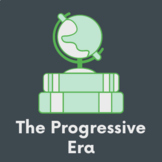 Great information that I created and use when covering the Progressive Era!